Had Chicken pox when she was six years old. He 67 years father had depression and Glaucoma and her 58 years old mother is known Diabetic. Maternal grand mother had Ca uterus, maternal grand father had Ca Oesophgus, and maternal grandfather’s sister had Ca cheek. Her younger sister was suffering from depressive disorder. Father’s brother has nervous weakness. Sweat : Since 1 yr, profuse all over. Tight clothes aggravate, uneasiness, but adjust with it. Before craves raw rice, now not. 1ST Four deliveries - Ftnd, died immediately due to deformed skull. She is the eldest, has 2 siblings; father worked as mechanic in TVS. Father was very strict+++, military like; so adjusts to everyone but feels inside that they are doing like this. She studied 8th std; married at 15 yrs, consanguineous marriage, own maternal uncle. She is the eldest daughter-in-law. Even if she do so much work, others are not satisfied, so everyone always finds fault with her; so much stress for the past 1 yr; wants to satisfy everyone. · Active; does all work even when she is sick. Wakes daily at 5.00A.M; must take bath in early morning hours daily, never skips that. · Don’t get anger easily; don’t fight with anybody. 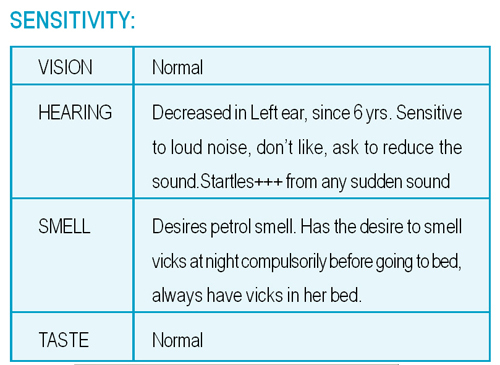 · Anxiety and weeps easily if she hears that anyone is sick or on hearing anyone in hospital. Weeps on seeing sad scenes in T.V disturbs for many days sometime don’t get sleep due to those thoughts. · Weeps++ even from slightest words; weeps easily in front of others, feels for a long time. · Don’t like anyone teasing her, starts weeping++. · If criticism is true, she corrects, otherwise wont. · She even cooks for 10 persons at a time; very active, does all work by herself. · Fastidious+++ wants everything to be very neat; things must be in place if any slight change in position, feels irritable. · Don’t like others touching her with dirty hands. · Disgust to everything. Often wash hands; cut her nails every week regularly. · Punctuality+++ arrives before the time, 1hr before if others are late, gets angry but don’t express out. · Think and decides by her own, once decided, won’t change it. · Spends money to need, wont go by auto, go by walk only. · Receives guests very well; treats them very well. · Forgets what she has just come to say. · Dreams; unremembered, often that she is getting a female child, want to make her study, treat her like her daughter. · Has normal GOD faith. Don’t ask for this and that. Must do work properly that will itself benefit us. · Much responsibility as she is the eldest daughter-in-law; she does it well. · Finishes her work on time, don’t postpone it. · Does not like if any one talks without respect, gets angry, expects other to respect her. · Avoids watching fight scene, does not like to watch. Normal endometrium is seen as a thin layer on both sides of the anechoic endometrial cavity. 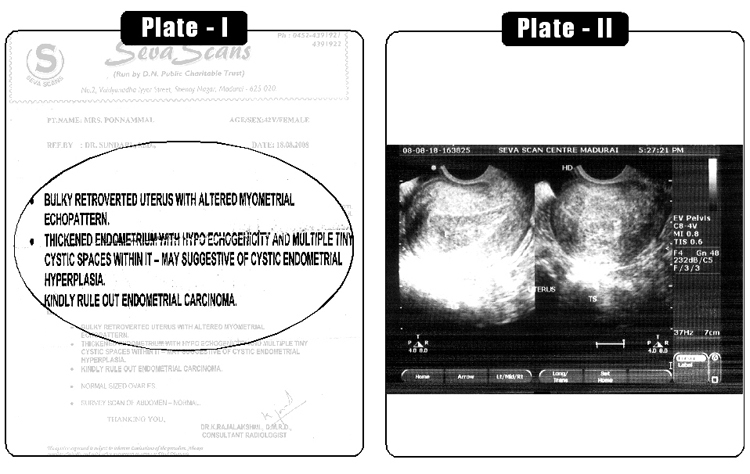 During the normal menstrual cycle, the endometrium becomes progressively thicker and more echogenic. 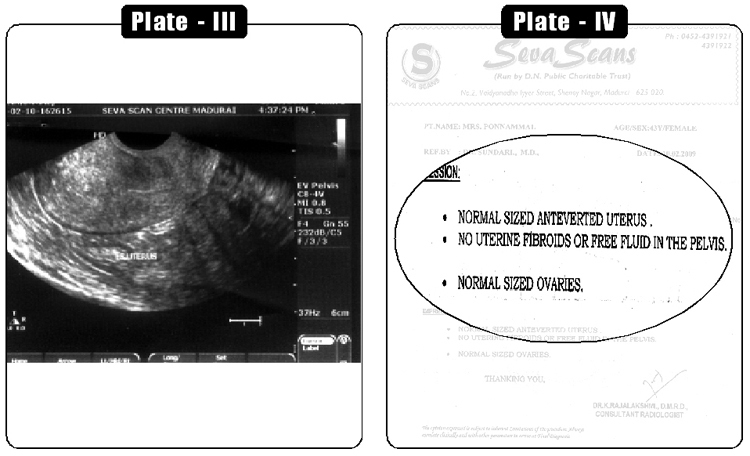 The endometrial thickness, measured as the double thickness of the echogenic layers, may reach up to 10 mm. After the menopause, or during ovulatory suppression, (e.g. oral contraceptive usage), the endometrium is inactive, and is seen as a thin layer of under 5 mm in thickness. In endometrial hyperplasia, the central endometrial echo complex is thickened, measuring over 10 mm. It does not demonstrate the normal variation in appearance during the menstrual cycle. In severe cases the endometrium may measure up to 5 cm in thickness. Endometrial hyperplasia involves the proliferation of endometrial glands that results in a greater than normal gland-to-stroma ratio. This results in varying degrees of architectural complexity and cytologic atypia. The clinical significance of this diagnosis is progression to or concurrent endometrioid endometrial adenocarcinoma. · Had throat pain with mild fever for a day. Phlegm in chest and throat since a week. Menses was regular, No Headaches. Generally feels good. Normal sized. Anteverted uterus measuring 7.5 x 4.2 cm.